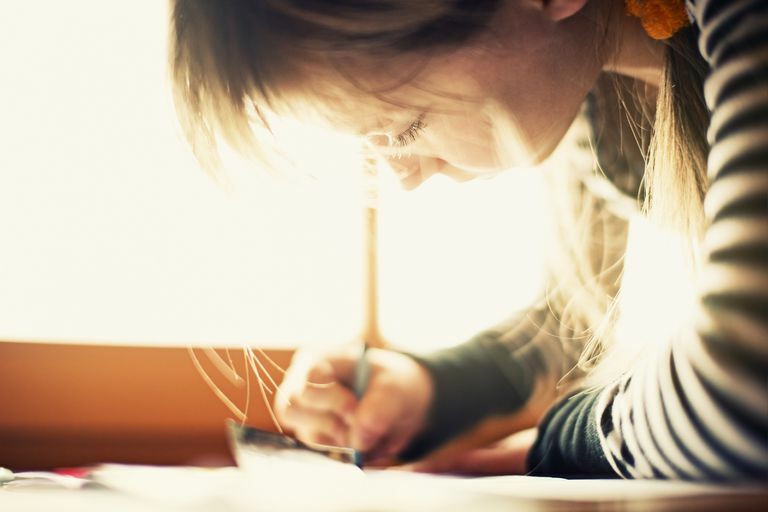 When you teach your child to write, you're developing his fine motor skills. You're also preparing him for school because most kids know how to write at least a few letters by the time they are ready for kindergarten. Make handwriting a fun activity when you teach your child to write his name in five easy steps that are educational and frustration free. Learning to write his name is a proud accomplishment and a skill he'll use throughout his lifetime. Make the task easier when you print his name as an outline for him to follow. Using a word processing program or graphics software, choose a large font, not a small size, and select the outline option. Type out your child's name and print. With pencil in hand, he'll focus on staying in between the lines while he follows the pattern of the letters in his name. For repeated use, put a plastic sheet protector over the paper. He can use a dry erase marker to practice writing his name over and over again. Let him learn the motions of the letters in his name when he writes with his finger. Use salt, sand, shaving cream or pudding as a writing tool. Salt or sand can be spread on a tray to keep the mess to a minimum. Shaving cream and pudding are messier, but some kids will sit for a longer amount of time because they're having more fun getting dirty while writing. Just use the kitchen counter or a tray as his writing canvas. Since he's just learning, don't force him to write his name like you would on a piece of paper. Let him use his gross motor skills to learn the motions of writing his name. As he gets better at writing each letter, you can help him work on those fine motor skills through this and other fun learning activities. Take learning outdoors. Buy or make your own sidewalk chalk that's fat enough for him to wrap his hand around comfortably. Write his name in large letters. Ask him to try to mimic your drawing. Write his name smaller. Now see if he can write his name smaller too. You're working toward scaling down an oversized version of his name to one he'll actually be required to write on a piece of paper at school. Once he's ready to try it on a smaller scale, sidewalk chalk works great on construction paper and actually looks like a work of art when your child is finished practicing. Use a highlighter to write your child's name in large letters. Now let him pick his favorite color marker and trace over your letters. Make sure you choose a highlighter color that is lighter than the marker he's going to be using. He needs to be able to see his attempt at writing his name over the letters you wrote with the highlighter. Kids love writing on a dry erase board. He'll be able to practice, practice, practice without using a lot of paper. A dry erase board has long-term use. After he learns to write his name, he can learn to write other words and begin tackling phonics. You can also use it as a teaching tool when you're ready to tackle math, English, and other subjects. Teaching a child to write his name takes practice and patience. Let him learn in his own time but practice a few minutes every day. As he begins to perfect his writing, you'll notice he can start writing with smaller letters with handwriting that becomes easier and easier to read. Is Your Child Ready to Stop Using Their Baby Bath?